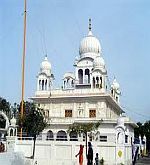 Gurdwara Manji Sahib Alamgir Situated in Alamgir Village near Ludhiana Distt. 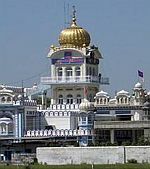 Gurdwara Nanaksar Jagroan Located about 38 km from Ludhiana. Badshah Sikandar Lodi, the second ruler of the Afghan Lodi Dynasty reined Ludhiana from 1481 AD. The commissioners sent by him who administered Ludhiana Jurisdiction on his behalf set up the historic Lodhi Fort in the last decade of 15th century. Erected right on the river banks of Satluj, the crucial location of the fort assisted in the protection of Ludhiana against enemy attacks. Thought much exalted in olden days, this ancient military fort dated back to more than 500 years is now in a damaged and devastated condition. One of the military lieutenants appointed here by Sikandar Lodi; Nihang Khan stayed in this massive castle and protected the entrance to the newly established �Lodhi Ana�. Maharaja Ranjit Singh, who governed Ludhiana for some years, repulsed many British encroachments with the help of the muscular architecture of Lodhi Fort. However, with his decline, the Fort did fall into the hands of British Regimes. This gargantuan and gigantic structure, sprawling over an extensive area of 5.6 acres was very well conserved during the British Raj. In the post Independence era, Sikh regiments of Indian Army were imbedded in this fort for some decenniums. But as they withdrew, the downfall of Lodhi Fort commenced and the fort started crumbling due to the lack of maintenance. Adding to this, the citizens of Ludhiana also started digging the fort and encroaching upon it for making room to build their houses and shops. Even the Archaeological Department of India is not paying any heed at the preservation of this historical edifice of Punjab. Some parts of the fort have completely vanished today and no one is even bothered about it which is really incredible. Today, the grand history of Ludhiana is represented by only some ruins of the ponderous outer wall, two colossal gates opening to the winding paths directing towards the interiors of the fort and some demolished barracks. It is said that Maharaja Ranjit Singh got a tunnel dug up here that linked the Lodhi Fort with his palace at Phillaur. The tunnel passed across the river Satluj. Today, the interiors of this tunnel are not reachable, but only the entrance is visible. In this fort the Government Institute of Textile and Dyeing Technology was housed but as it shifted the location the Lodhi Fort is now left unguarded and neglected. Phillaur, a small town in Ludhiana District was originally named �Phulnagar� in the honor of �Sanghera Jat Phul�. This hamlet served as a vital perimeter site and controlled the most frequent ferry at Satluj. Maharaja Ranjit Singh, noting the merit of this vicinity ordained here a strong force under the pilotage of Governor Mohkam Chand. This army was stationed at Phillaur for 4 years from 1808 to 1812. When Maharaja Ranjit Singh was overpowered by British at Ludhiana and they took over the Lodhi Fort, as a countermeasure he established this strong fort at Phillaur. It is chronicled that the fort at Phillaur was designed by Dewan Mokham Chand and the �Project Fort� was taken up and executed by an Italian architect. 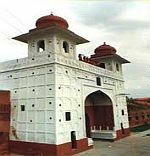 This fort, changing hands from Sikh Rule to British Governance, is now engaged by Punjab Police Academy. Today, a police training centre and the Finger Print Bureau are operational in Phillaur Fort. Nehru Rose Garden, one of the most verdurous and greenest spaces in the boundary of Ludhiana was set up in the year 1967. Lounging over an extensive area of about 27 acres, Nehru Rose Garden is the hugest rose garden in the entire continent of Asia. This garden boasts of its largest collection of rose flowers which numbers to 17000 plants representing more than 1600 floral species of our national flower; Rose. This rose garden, a paradise personified is a floral dream came true in its real sense. This is one of the most sought after tourist destinations of Ludhiana and a perfect hang out with family and friends. This far reaching garden is also ornamented with several fountains placed at regular intervals. These musical fountains are brightly illuminated at nights and the water rocks to the tunes of popular melodies. Nehru Rose Garden is noted for hosting the Annual Rose Festival of Ludhiana. This festival is honored to have found place in the list of national fairs and festivals of India. This Rose Festival is one of the major cultural events of Punjab that draws thousands of tourists, nature lovers and photographers from every corner of the country and globe. Verdant green landscapes ornamented with deluge of multihued rose flowers, ambience furnished with the sweet fragrance of blooming rosebuds and the musical fountains embroidered with sparkling lights renders this tableau an Arcadia epitomized. Nehru Rose Garden, a not to miss picnic spot in Ludhiana is a seraphic dreamland descended on the earth in its real sense. The Clock Tower, widely reckoned as �Ghanta Ghar�, is the representative emblem and the prime landmark of Ludhiana metropolitan. The Clock Tower or �the Victoria Memorial Clock Tower� was inaugurated on 18th October 1906 by the then Lt- Governor of Punjab - Sir Charles Montgomery and the then Deputy Commissioner of Ludhiana - Deewan Tek Chand. This clock tower had been erected in the honor of the silver jubilee of Queen Victoria�s reign. Victoria Memorial Clock Tower was rechristened by Giani Zail Singh - the then chief minister of the state as �Bhagwan Mahavir Clock Tower� yielding to the insistence of the Jain community of Ludhiana. Yet, all these names are forgotten today and this clock tower is known only by the name Ghanta Ghar. Positioned adjacent the railway station in Chaura Bazar, the Ghanta Ghar; the icon of Ludhiana comprises the epicenter of the city. All the commercial and political activities of Ludhiana are centered here. The original clock of this Ghanta Ghar which was installed by British was a manual one. As it had worn out over the years, the old clock was replaced just 12 years back by a new electronic clock. Though there are many clock towers in Punjab as well as in rest of the country, Ludhiana is especially recognized as �the city of Ghanta Ghar�. In early 20th century this clock tower was visible from almost everywhere in Ludhiana and people used to harmonize their watches with the time of Clock Tower. Nevertheless, now the city is congested with the cluster of countless sky scrappers which has resulted into limiting the visibility of Ghanta Ghar. Today, Ludhiana Municipal Corporation looks after this clock tower the stamp of Ludhiana. Machhiwara, lodged along the south banks of the river Satluj is the panchayat town in the Ludhiana District. Placed nearly 35 km from Ludhiana, Machhiwara town is particularly revered for being the auspicious venue where Guru Gobind Singh; the 10th Guru of Sikhism had halted after the great battle of Chamkaur Sahib. Acclaimed far and wide for housing the scared Gurdwara of Charankanwal Sahib, Machhiwara is a most prominent pilgrim destination of Sikh Community in Punjab. This Gurdwara nestled near Bus Stand on the Charan Kamal Road in Machhiwara city is connected with Ludhiana-Chandigarh highway by Guru Gobind Singh Marg. Venerated a lot by the Sikh Community, this Gurdwara is built on the very site where Guru Gobind Singh had rested for a while and drank a sip of water. Machhiwara is also the exact locale where three of his ardent devotees Daga Singh, Dhram Singh, and Manu Singh joined the league of Guru Gobind Singh. This sacred Gurdwara that commemorates the significant event of the history of Sikhism is also esteemed for its architectural marvel. The Gurdwara Charankanwal Sahib celebrates its annual congregational fair on the 9th and 10th day of Poh, in the honor of the anniversary of the Guru Gobind Singh�s halt here. This annual fair organized in the month of December beckons myriads of devotees from all over the state. �Gurdwara Manji Sahib Alamgir�, located about 11 km from Ludhiana at a small village named Alamgir, is another much apotheosized place of worship in the state of Punjab. Alamgir is the same village where Guru Gobind Singh had arrived at the end of an expedition in search of water. As he didn�t find any drinking water, he shot an arrow in the ground and water flew out from there miraculously. The tank that bounds this naturally oozing water is known by the name �Tirsar Tank�. Devotees believe this to be a very holy tank and make it a point to bathe in its sacred water. Manji Sahib Gurdwara is an imposing six storied edifice erected in the holy memory of Guru Gobind Singh who had stayed here for some days. He was dressed in the garb of Pir of Uchch and carried in a palanquin to this place by his followers. Guru Gobind Singh had concealed himself from Mughal enemies and found refuge in this village. As Guru Gobind Singh had come in a palanquin, i.e. Manji, the Gurdwara established at this place is named �Manji Sahib Gurdwara�. The very palanquin is still preserved in the basement of this scared shrine. Gurdwara Manji Sahib Alamgir is a symbol of religious harmony as Guru Gobind Singh was helped and protected by two Muslim civilians Nabi Khan and Ghani Khan from Muslim Army. A resident of Alamgir - Bhai Naudha gifted Guru a horse. So Guru Gobind Singh discarded the palanquin and escaped on the horseback saving himself from Aurangzeb�s army. 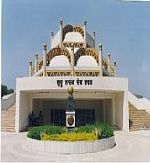 The Gurdwara Nanaksar Jagroan, reckoned as the commemoratory monument built in the honor of the venerated Sikh Saint �Baba Nand Singh Kaleranwale� is located about 38 km from Ludhiana. This is also the very locus where the tenth Sikh guru, Guru Gobind Singh fell during a great war against the Mughals. 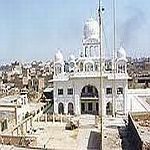 Presently, this Gurdwara of Nanaksar Jagroan has been converted into a holy shrine which has got international followings from the countries like UK, USA, Germany and Canada. A small water tank is situated in the premises of this Gurdwara. Every year in the month of August The Gurdwara of Nanaksar Jagroan celebrates its annual festival. The Gurdwara is thronged with the devotees alighted from every corner of Punjab at the time of this festival that lasts for five days. Pir-I-Dastgir Shrine, popularly known by the name �Abdul Kadir Galani� is strategically positioned right in the premises of the Ludhiana Fort in the north western Ludhiana. The most interesting feature of this shrine is that both Hindu and Muslim devotees equally honor and revere this place as it houses the tombs of both Shah Shuja�s family as well as many Muslim Saints. Bilwanwali Masjid, also worshipped by two other epithets; �Sarai Doraha� and the �Mosque of Kamal-ud-din Khan� is located on the main highway of Ludhiana city. The term �Doraha� implies �the place where two paths meet�. This ancient mosque is dated back to the reign of the great Mughal Emperor Jahangir. Rectangular in its shape, this edifice bears several rooms and verandahs built on all its sides. Two massive double storied gates extensively decorated with blue and yellow glazed tiles and intricate brick carvings guard the entrance of this Sarai. These two gates are still intact and have survived the test of time. They stand as the testimony of the ancient eminence of Mughal Empire. The courtyard of this Sarai also houses a mosque and a well. Guru Nanak Bhawan, an air-conditioned auditorium is one of the two theatres of Ludhiana where various plays are staged. This auditorium is the first of its kind in the Ludhiana city. In the year 1986-87 on the day of Shri Guru Nanak Dev Jayanti, Guru Nanak Society registered itself with the Registrar of Societies, Punjab. The land was allotted to them by the Government of Punjab in the year 1987. The construction of Guru Nanak Bhawan commenced in 1996 and the Guru Nanak auditorium was inaugurated on 2nd April, 2000 by the then Chief Minister of Punjab. Guru Nanak Bhawan is a multi complex that houses different sections namely an auditorium, an open air theater, a shopping arcade and a library. Maharaja Ranjit Singh War Museum, a tribute to the gallant soldiers of Punjab is located near Hotel Amaltas, about 5 KM from Ludhiana Railway Station on GT Road, Ludhiana � Amritsar Highway (NH-1). Instituted in the year 1999 this museum of international level is equipped with History Gallery, War Heroes Gallery, Uniforms Gallery, Air Force and Navy Gallery, Signal and Medical Corps Gallery, Kargil Gallery and an Audio Visual Theatre. At the very entrance, a huge statue of Maharaja Ranjit Singh in the sitting posture is placed on a magnificent throne. Beside this statue we can see many tanks, anti-aircraft gun, apec car, car scout, an old sukhoi fighter aircraft and a model of the ins vikrant. In the entrance hall, the portraits of those Punjabis, who have been awarded with several national honors like the Paramvir Chakra, Mahavir Chakra and Vir Chakra, are placed. Various portraits of generals, admirals, and air chief marshals belonging to Punjab are also kept here. The museum has several galleries. A huge gallery exhibits various uniforms of the British era Indian army, navy and air force. They also display the different medals, stripes and ranks worn by the officials. Another gallery displays the portraits of Punjab�s army men who fought in the three Indian wars in 1948, 1965 and 1971. There are six busts placed in the gallery of officers who were honored with Victoria Cross. The light and sound show is yet another attraction of this museum. This show relates the story of independence struggle of India and the role played by the Punjabis in it. Another light and sound show entitled �A Sonnet Lumiere� has been installed at the War Museum on the permanent basis to perpetuate the memory of those brave soldiers who sacrificed their lives in the freedom struggle of India. Kargil Garaly covers the complete story of Kargil war. Historic Gallery contains Diorama of 1st and 2nd battles of Panipat, the Anglo Sikh War (Battle of Aliwal) and also mythological and historical Rama Ravna Yudhha, Alexander and Porus, Maharaja Sher Singh, also Sardar Baghel Singh and his great companions. The Gallery displays the portraits of Nawab Kapur Singh, Sardar Jassa Singh Ahluwalia, Talking Soldiers of Krishna, Gupta, Mughal, Sikh epoch etc. They have also installed Muti-Media kiosks that provide detailed information. 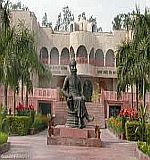 The Punjab Agricultural University Museum, positioned within the campus of Punjab Agricultural University is located on the outskirts of the city on Ludhiana Ferozpur Road. Celebrated as one of the foremost educational sightseeing points of the state, this museum attracts both students and knowledge enthusiasts. The Punjab Agriculture University was established as a minuscule Land Grant College of America in the year 1962. This museum built in the semblance with traditional rural houses is the rural history museum of Punjab. A 100 yard long path consorted by water channels on both the sides directs to the finely carved entrance of the museum. This is the only university in the country that houses this type of museum. The museum exhibits various articles that present souvenirs of local arts, crafts, tools, junkets used to decorate draught animals and several other varieties of ancient objects. The Punjab Agricultural University also organizes the popular �Kisan Mela� every year when different farming equipments and old bronze utensils are displayed and new techniques of farming are imparted to the farmers. The visiting timings of the museum are from 9:00 am to 1:00 pm and from 2:00 pm to 5:00 pm. The entry fee charged here is two rupees per person. Hardy�s World, an assortment of immeasurable fun and unlimited entertainment is located just 7 kilometers outside the city on the Ludhiana Jalandhar highway. India�s third largest indoor snow city, Hardy�s World is an amusement park that attracts both kids and grown ups. Packed with a number of exciting rides and lots of fun in water city this theme park offers an unrestrained enjoyment to all its visitors. Hardy�s World is a perfect weekend getaway for the Ludhianavis. A visit to this extravaganza relieves you from all the every day tension and delivers you completely refreshed and rejuvenated. Amaltas Tiger Safari, located about 6 km from the main city on Ludhiana-Jalandhar Highway (GT Road) is one of the foremost tourist destinations of Ludhiana. Spread over the sprawling area of over 25 acres, this zoo was inaugurated in 1993. Other than the royal tigers, the zoo also houses many other animals including sambhars, rabbits, black bucks, peacocks and many more. Watching the aristocratic tigers majestically roaming around in the jungle is an experience of life time. The Wild Life Department of Punjab has handed over the contract to a private company that conducts the tiger safaris here. They have two buses that carry the tourists into the dense forest, the domain of tiger. We get a chance to watch the king of the jungle freely wandering about and bathing in water pools. Most of the times the tigers are seen sitting lazily or sleeping under the shade avoiding the sunlight. This is because they are fed very well and they don�t have to hunt for the food. Their dinner bell rings at 5 pm when tigers are catered with fresh meat. The smell of the raw meat draws them to the enclosures where they are locked for the night. Amaltas Tiger Safari observes an off on Mondays when it�s the cleaning time. Visiting Amaltas Tiger Safari in Ludhiana is really a thrilling experience.